Dadex Building Pipes and jointing accessories are approved by Pakistan Standards Institute for use as rainwater, vent, waste, soil and drain-water pipes. These pipes are seamless and have a clear, dust-free finish with a smooth internal bore allowing for reduced friction and easier flow when compared to the metal pipes. Dadex Building Pipes are suitable for rain and soil water disposal and evacuation of smoke and foul/sewer gases. They can also be used for waste and drains of bathrooms and kitchens, provided they are properly bedded and encased in all types of residential, commercial and industrial buildings. 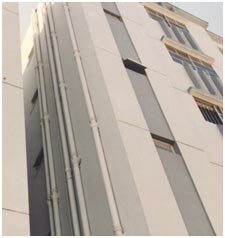 Due to their smooth surface Dadex Building Pipes could also be used as a facia for circular columns. For this purpose, concrete and reinforcing steel are to be designed for introduction in the pipe’s bore in such a manner that no direct load is transmitted on the pipe. Due to their non-electrolytic and non-inductive properties, Dadex Building Pipes have been used as conduits for underground electric and telephone cables. 60 and 80mm in 7mm thickness, 100mm in 8mm thickness. Pipes: PS 429: 1988, ISO: 391: 1982. PS: 2035: 1988 & ISO: 392:1986.